School Children Set an Example! School Children have an incredible ability to raise crucial funds to help others – and the best ideas of how to do so! Over the years, Patricia Parker MBE Founder and CEO of Kids for Kids has given many presentations to eager children who are willing to learn, connect, and take action. We have seen some incredible fundraising ideas, some of our favourites being: cake bakes, crazy hair days, summer and Christmas fairs, sponsored walks for water, garage sales and of course, a real favourite – selling smoothies during the summer months! Children can do so much to raise funds because every penny counts to families in Darfur who have nothing. Many schools have adopted Kids for Kids as their long term project, knowing that we are fanatical about spending the maximum possible on the ground in Darfur, not on overheads. We are determined that every pound raised, often with real personal effort, makes a real and lasting difference to children in desperate need. Schools that continue to support us include Southbank International School, Hampstead; St Paul’s School, Dorking; KICS, Khartoum; Bishop Thomas Grant School, London; Edgeborough School, Farnham; Worth School, Turners Hill; Queens Gate School, London; Cheam School, Newbury, and more. We welcome invitations to come to speak personally to students so they can have an unique chance to learn how children their own age live in Darfur. Patricia has been delighted to speak recently to two exceptional schools. The first was morning assembly at St Swithun’s School Winchester at the invitation of Chaplain Paul Wallington, where 500 students and their teachers learnt about the work that Kids for Kids does helping children in Darfur who have no hope. The girls will be selecting three charities to support in the coming academic year, 2018-19. We are keeping our fingers crossed that Kids for Kids will be their international choice. Children face famine this year. We need all the support possible. The second school Patricia visited was Dunottar School Reigate where she met the school charity committee. Patricia said “What an inspiring group of young people – it was such a pleasure seeing their enthusiasm and empathy with others so far away, leading very different lives.” We are delighted to hear they are organising a Mufti Day and Rounders Match in support of Kids for Kids! These are only two of the visits Patricia has been making to schools in England. Back in January she presented the work of Kids for Kids to the City of London School, where the students had previously raised over £86,000 to support the charity. Patricia was able to tell the students exactly how the money they raised was spent, and how many people they have helped, and will continue to help, through the charity’s sustainable long-term projects. 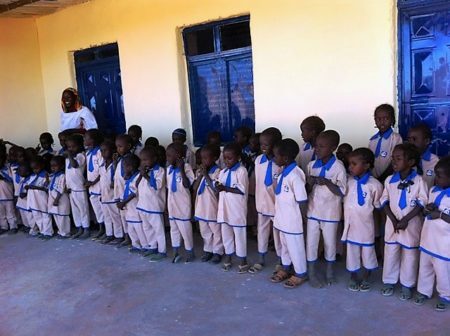 There is now a village and a new kindergarten in Darfur adopted by City of London Boys, and named after the school as a permanent reminder. No other school has – so far! – done so much in such a short time. Thank you everyone at City of London. It is rare for a charity to be able to account for every penny a school raises, and even rarer for the Founder of a charity to be able to speak to a school. Learning about Darfur from Patricia’s first-hand experience is a very special treat for children who are just exploring the world’s many charitable causes.